This Luxury Townhouse Has Three Bedrooms And Two Full Bathrooms. Full bath on the first floor and full bath attached to master bedroom on the third floor. Good place for a family vacation! I recommend this townhouse. Our family had a good time at our stay in Lincoln NH. Although we didn’t have a time to explore the property amenities that’s a good place to stay with the family. Lincoln offers a bunch of things to do. The owner responded to our request to rent the place right away. The only reason I reviewed as 4 stars is because the House was dusty and there were dead flies on the living room window. We had a wonderful time and the place was perfect for us. Plenty of room, great location, and lots of fun! We are so glad that you enjoyed yourselves! Thank you for staying with us! The property was decent, it suited our needs for 3 adult couples. We had some hiccups with the property, however, Alyson and Matt did their best from afar to make things right and comp us appropriately. They were lovely to work with in the process! There is no AC and only a couple of fans in the house which was a bit uncomfortable during a hot summer weekend. The townhouse is fully stocked with supplies which was awesome! It's about a mile walk from Loon Mountain but if you're up for a bit of a hike in the summer it's not bad (for reference we did it 4 times during the highland games weekend). Another bonus is that the area it's in is quiet, we heard nothing by way of noise during our stay! Thank you Jen! We hope you had a great stay! We enjoyed our stay so much!!! The property was well maintained and the beds were comfortable. We have stayed at the Village of Loon many times over the past 20+ years and this unit was our favorite!! We are so glad you enjoyed yourselves and we would be happy to have you again as our guests anytime! Very easy to find, across from Loon Mountain. Plenty of parking right by the front door. When I first entered the condo for my stay I was happy to see a nice area to sit and take off snow boots or winter gear, a huge plus for skiiers. The living room is comfortable with a large couch that has multiple recliners, TV with a DVD player, WiFi and even a fireplace. There is a large dining room table which would work great for a big family. 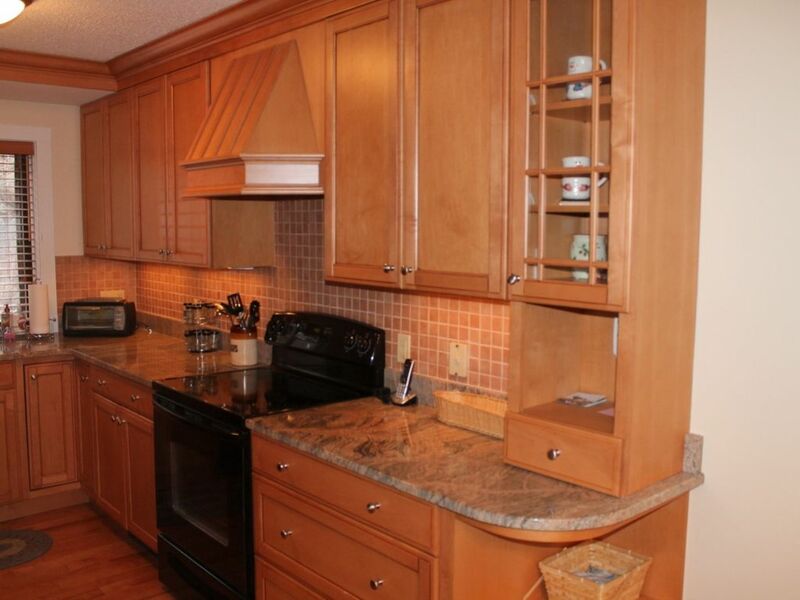 The kitchen was very clean and modern with new appliances and granite countertops. It was also very well stocked with everything you'd need to cook a big family dinner ( pots, pans, cooking utensils, etc). The master bedroom was spacious and had some great views of the mountains. I was very impressed with the overall cleanliness and comfort. It feels like a home, not a hotel. You can see that things have been maintained and cared for. The lower level bedroom was clean and quite roomy as well, with direct access to the second bathroom/shower. There is even a washer and dryer so you can do laundry if needed! The bunk bed room is perfect for families, it could easily sleep 6. There is a back porch off the dining room which is a great spot to drink your morning coffee and take in the mountains. This is a perfect place to stay in the winter with great access to Loon and other ski areas. A summer stay would be amazing as well, Story Land and Santa's Village are fairly close. I think I found my family's new favorite getaway.